After much anticipation, Dragon Door Publications has finally released Convict Conditioning 2! While the actual paper book will not be available for purchase until mid-December, you can download the E-book in PDF format right now by clicking the link above! This follow-up to the groundbreaking bodyweight training guide Convict Conditioning contains the most thorough write-up of how to train for the human flag ever in print. Author Paul Wade and I worked together to design the flag progressions, so for everyone whose written me asking for more advice on this move, make sure you pick up a copy! The cover of the book features a photo of my brother Danny and I performing our infamous two man human flag and the inside of the book features over 50 additional photos of Danny and myself. In addition to the section on human flag training, there is lots of other useful info crammed into the 300+ pages of Paul Wade’s latest masterpiece. 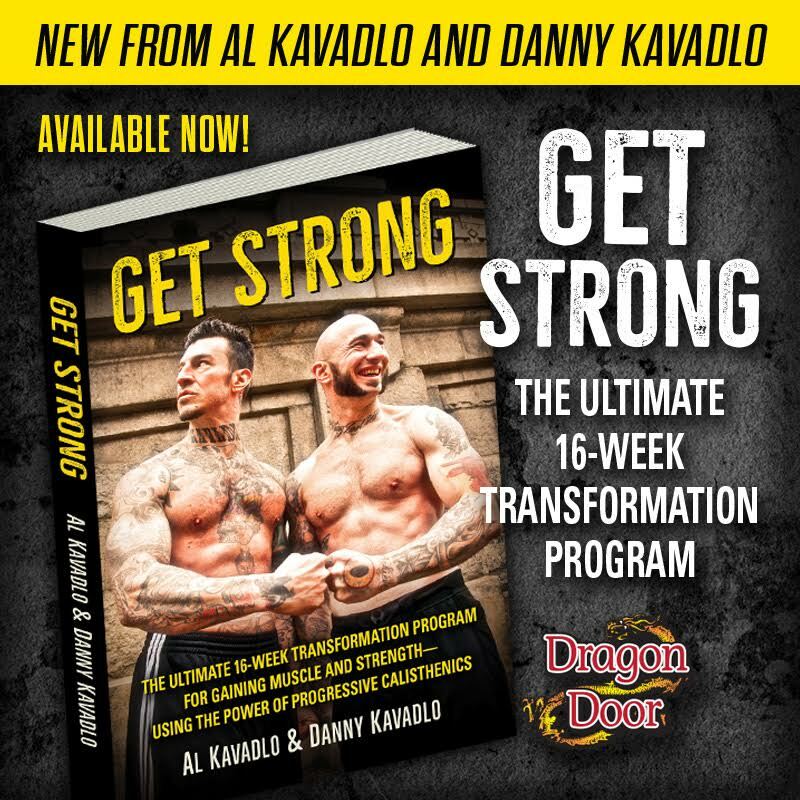 Check out DragonDoor.com for more info. Is this a revised edition? or a whole new book? It is an entirely new book packed with great info! I just bought the book. Nice work. Thanks, Marc! Everything is debatable! I’d rather be infamous than famous. Watch it, or Al will shank you. You actually think that cover picture is photoshopped? Can’t wait to read this book. The 1st one was awesome. Well you don’t have to wait any longer – you can download the PDF right now! Do you think that training for the human flag would also help about being able to do muscle ups? And is it possible to download your other book in ebook format? Do you think that I must read convict conditioning before I read convict conditioning 2? Or which one I read first does not matter? Thank you Al. I don’t think it matters what order you read them in, but I agree that you should read both. I highly recommend you read and follow CC1 first, as building your strength in the Big 6 moves is more important than “secondary” muscles that are focused on in CC2. I have both now, and I found CC2 a decent read, but CC1 is definitely the main course. For those concerned about the theme of prison training, whether it’s true or not, the idea is that you can do effective training without excuses of a gym or weights, or any other external conditions which you might be lacking and could normally use as an excuse to not train. As for the flag, I find it to be a harder exercise than the muscle-up, so get the m-up first and then move on from there. Thanks for your answer Al! I think reading my book will be very helpful for you, Anil. I’m glad you finally ordered it! I love the contents in the first book. I must have the second one. Right on, Lynn – you download it yet? HUGE fan Al. I appreciate all your videos. Tell us what it was like to meet the legend Coach Wade? What is he like? Thanks, Neil! In my conversations with Coach, he’s been just like he comes off in his books: gritty and streetwise but also a class act. Why even get involved in the promotion of a book with that title? It smacks of a cheap gimmick and you’ve come down in my estimation badly Al with this. Wade doesn’t exist for the people that don’t know this whole convict thing is just a scam thought up because it’s a sensational headline and will sell more books. Bad move Al prison is the lowest point in a persons life and i don’t think it should be promoted in this way even if it’s tongue in cheek. Regardless of any hearsay about Paul Wade’s identity or the validity of his story, I believe the information in the book will be very useful for people interested in bodyweight strength training. I picked up a few useful gems from it myself and I’ve been doing calisthenics for almost 20 years. I hear you Al and i agree, if there’s something worthwhile in the book then it’s definitely great for folks to get it despite the title and the convict thing, thanks for writing back. I wan to know more about this? I was thinking the same thing..
Al, big fan of your work. I already ordered the book yesterday. Excellent job with your contribution. Everybody – if you are interested in bodyweight training, both of coach Wade’s books are a must. Thanks for the endorsement, Yavor! i’m going to order it right now. i loved the first one–i’ve moved through a lot of the progressions just as prescribed (except for pull-ups which i think has jumps too big from one step to the other toward the later stages) in the 2+ months i’ve been following it. i’m most excited about the human flag series. i can do a muscle-up but the human flag seems impossible. thanks for all of the great info on the site al. Congrats on your progress, JB! I think you’ll find CC2 is just as good, if not better than the first one. I read the first book a year ago and the simple, easy progressions got me working out straight away and I have improved considerably since (at first I couldn’t hold a handstand for a second, now I am approaching close-grip handstand press ups). I enjoyed the second book too but I felt the homophobic language in it was hurtful and unnecessary and I wish an editor had pulled the author up on that. Sorry if you found parts of the book offensive, KC. I give the book my endorsement based on the workouts, not the politics. Regardless, I’m glad to hear you’ve been making progress in your training! I wasn’t happy with my progress on certain movements, most particularly pistols and HSPU’s, until I took Paul Wade’s advice and began to regard them as strength exercises, not so much skills, thus restricting them to once a week and providing for ample recovery. I’ll likely be ordering this. Glad the first CC helped you with the pistol squat. There is certainly some skill to the move, but it’s also a very demanding exercise that requires adequate rest. I’ve read the first CC book and found that it’s was an inspiring peace of work. I’ve been working with the proressions for at least a year and results are coming. Slowly but, practice makes perfect. When I saw your post on CC2 then I surprisingly transformed to a five year old kid adding the book to my Christmas giftlist. Now I got the second book and have started to read it and I have found it as massive as the first one. Nice work on the Flag sections. I’ve question and your are free to answer if you want to. When practising the flag the book does not mention if you shoud train both sides. Maybe it’s so obvious. My first thought was Of course you should dummy! But since you collaborated in the making perhaps you have an answer to the question. Anyhow congrats on the contribution made by yourself and your brother as well. Hi Replying to my own comment above I read in the next section on Press Flag that one should practice the flag on both sides. My bad. Glad you figured it out for yourself and good to hear you’re enjoying CC2! Lol, when I started training the clutch flag, I noticed after a few months that my right bicep had become disproportionately larger than the left, so I started training the left side, and it came a lot easier than my right( I was able to lift right up horizontally without going through the progressions again!). Still trying to figure out the press flag though. Ever wonder WTF you’re going to do when you run outta cool skills to train? Lol, it’ll be a while for me! Take heart in knowing that there are always further challenges. As you progress, the harder skills take longer, even if the relative difficulty is similar to that of the last skill you trained. I think this is because, as you approach your potential, you have to put exponentially more work into your training to continue advancing at a linear pace. You will never run out of challenges. As difficult as the press flag is, it is actually a relatively rudimentary feat of strength compared to high level gymnastics rings skills. Consider that there are only a few people in the world who can convincingly do a Victorian Cross. Then there’s the C.T.I. Jasper Benincasa could hold it for about 3 seconds, yet his record for alternating one arm chins was 50 in one set. Always room for improvement, even for the best of us! That’s what makes my training/life in general worth it. And Gymnasts are beasts of another breed for sure, but that’s because they pay their dues with the foundational work. 50 one arm chins, that’s a nice bench mark! I’m a big fan of your tutorials. I liked CC and will probably by CC2. But does Paul Wade actually exist? Have you met him? What’s he like does he still look fit? Also, in CC, is the form illustrated for the one arm pushup possible? Can you or do you even know anyone who can do a one arm handstand pushup? Thanks in advance for your reply. “Author Paul Wade and I worked together to design the flag progressions…” Al, this is a quote taken from your CC2 promotion above. You insinuate that you and “Paul Wade” personally worked together on this design, yet you admit you never met him and will only go as far as saying that Wade “probably” exist. What’s the deal Al? I like you and love your workout material. Your the real deal. No doubt. I hope you didn’t sell your soul to John Du Cane and Dragon Door to promote an obvious fraud. Du Cane’s disclaimer in CC doesn’t excuse this absurd fraud. Don’t lecture others about theft when you assist Du Cane with this fraud. Walk away Al. Save yourself. You were just a model and were used by Du Cane to add legitimacy to CC2. i just started with CC1, since i find the concept really positive and generally like well-structured, progressive systems. also that badass-appeal is appealing to me (i’m aware there’s nothing to romanticize about jail, but i just prefer tanktops and boots instead of neon-turquoise leotards ;D ). but when i found this disclaimer at the beginning, that says, the book actually is NOT an autobiography and it’s all for entertainment – that was an uber-bummer for me. sure, that doesn’t make the the system worse, but i mean – WTF?? why come up with this big dramatic hard knock life thing and than it’s just fictional, maybe even ‘he’ is? don’t get that and find it a bit distasteful. @CC2 – is it ‘only’ about human flag (like Naked Warrior is only about pistols and one-armed pushups) or does it also contain other exercises? thanks for the review btw! There are many exercises covered in CC2. It is not just about the human flag. But hey the photos look great and in great form. Did like the simple towel hand grip strengthening method. That “free” copy you downloaded was illegally uploaded, which makes you and anyone else who downloads it a thief. Given the title of the book, the irony of such an action is not lost on me. Paul and I have had many conversations over email, though we have not met in person. I did not mean to imply otherwise. As I have said before, I give the book my endorsement because I believe it offers sound advice. You dignified that with a response? You are far too nice. Haha – I make it a point to try to reply to everyone who leaves a comment on my blog, but I appreciate your sentiment! Is there anything that covers cardio in CC2? or is it all just strength training? It’s primarily a strength training book. However, my understanding is that there may be a CC3 that will address things like cardio not discussed in the first two books. Hi- Kind of a weird question- i have CC1 but personally I have found a conflict. When i hit a pr in weightlifting I’m all kinds of happy, but adding reps in the early phases of CC gives me no joy. I can’t explain why a 5 pound gain in the weighted back squat makes me happy but going from a 20 level 2 pushups to 40 level 2 pushups I feel kind of meh about. I would like to master the 10th step but i have a hard time sticking it out. any suggestions? What are your goals? Do you want to squat 200kg + etc, or do you want to complete feats of strength like in the videos to the right? If you’re going to lose interest do bodyweight only training, it’s maybe best that you start lifting weights again. Nothing wrong with either, just whatever gets you motivated. I agree with the advice Mark gave you below. If you prefer weights to bodyweight training then do weights – both are great ways to build strength. If you’re looking for advice on staying motivated, consider ordering a copy of my book, We’re Working Out! A Zen Approach to Everyday Fitness. Hey Al! I am a huge fan of yours and of CC. I also agree with the whole training system in CC, but there is something Im not sure about and that is the flexibility part. Id like to hear your thoughts if I should really drop passive stretching entirely. I am trying to get flexible enough to do a high side kick and and some acrobatic feats that require split legs and I am really in doubt if active stretching is the way to go for that. Paul Wade’s active flexibility trifecta is a great tool, but it is designed to help tight individuals achieve a healthy range of motion while eliminating joint pain. If you’re looking to achieve hyper-flexibility (splits, etc.) you’ll probably need to do passive stretching. Remember that no book has all the answers for everyone. Books are resources, but ultimately we must each decide for ourselves what course of action to take. I remember asking you few months ago about CC “1”… and now youre on the cover of CC2!! And over 50 fotos inside, instead of bathurst (He’s a skilled beast)? Wow guys, keep on the great work, your blog has become a source for inspiration, thnx!! Thanks, Brandon! Jim is in this book too. There’s lots of pictures! Do you think the book will be printed one day?? Haha – Yes! The paperback version should be available in a few more weeks. I’ll be sure to mention it when the time comes! Al, Any word yet if the book CC2 has been shipped? Really looking forward to it. I believe that they have shipped by now. Sorry for the delay! Al, I just got CC2 today, and I am psyched. The cover photo of you and your brother is awesome. Is there any way of getting a copy of that photo autographed by the brothers Kavadlo? I have been using CC1 for the last 2 years, and made good progress. Right now I am focused on getting my first muscle up, which your tutorials have helped immensely. With that in mind, I am particularly interested in the Trifecta holds section, and the clutch/press flag sections. My question to you is, can I begin the clutch flag progressions using a 4×6 post that has my pullup bar and parallel bars in my yard, rather than finding a pole in the neighborhood? Is a 4x 6 post too wide or potentially painful i.e. splinters? Another quote from the book that resonates with me is the line “advanced pullup techniques are damn near impossible unless you are lean ‘n mean.” I’m 6’2″ 185. I’ve found that by dropping from 190 to 185 has really improved my height on explosive pullups, and I’m thinking another 5-10 pounds of weight loss may finally get me over the bar for my first muscle up. Thanks in advance for your input. Thanks, Chris! Glad you’re enjoying the book! You can try practicing the clutch flag anywhere that you want, though as you noted, a thick post will make it more difficult. As for an autograph, if you’re ever in NYC, shoot me an email and maybe we can meet up so I can sign your book. wow I thought that CC1 was amazing, but to know that you were involved with the making of CC2 is just fantastic! I’m primarily interested in CC2 for the information on calf training – I’ve always had skinny calves and as I’ve gotten past 40+ I seem to have picked up some knots and trigger points that keep me from running and jumping rope. Without giving the game away, can you give me an idea of how are the calf progressions are structured and if you think they could help? Love the site – you and your brother are the best possible proof of how good BW can be as a fitness and conditioning method! Thanks! While reading the book isn’t going to magically fix your calves, I definitely think you should pick up a copy. There’s a lot of good info in there you could benefit from, both calf and otherwise. 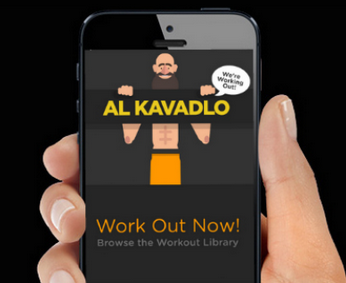 Track your CC workouts﻿ on Android with Criminal Record! Thanks for posting these. As a purchaser of the book its nice to see that others are out there doing Convict Condioning as well! I’ve actually just started doing CC and am logging my entire journey for others. If you want take a look and provide me with any constructive criticism, it would be greatly appreciated. Thanks in advance, and keep pushing! Nice blog, Big B! Keep training hard! Hey Al, loved the book! Ah, the flag…quite an odd move, when it comes to training. The thing about the flag is that, even though it is about as difficult as the back lever, in my experience it is actually more stressful, which I think is due to the unilateral aspect of the exercise. Not only do you have to train each arm for pulling and pressing, but also you have to train the on both sides! I personally have a problem with this, because my left shoulder does not feel secure when it is doing the pulling. So this exercise can be very tough, especially on the shoulders. In training for the flag, true, it is important to work the flag…however, don’t view it as abdominal work; while it is largely an abdominal exercise, it should be viewed as skill training because of the stress involved. But, don’t worry; you can build up a solid framework for pressing, pulling, and abdominal strength with other exercises. I built up the abdominal strength for the flag with L sits. Of course, training the other levers (back lever, front lever) will help here as well. Furthermore, training the other levers will also increase your pulling strength and shoulder stability for the flag, however in my experience those moves are less stressful on the shoulders. This is probably because, not only is the stress of pulling evenly distributed in both arms, but the shoulder angle is less extreme than that of the flag (that is, the flag simply pulls your arm outward from the socket). Hanging leg raises will also be helpful, of course. For the pressing strength, keep working those handstand push ups! Furthermore, you may want to work with one arm handstands against a wall. In my experience, this is *very* similar to the type of shoulder stress you have on the bottom arm in the flag. After having been able to hold one arm handstands against a wall for 20~30 seconds, I have had no problems with the strength aspect of the bottom arm in the flag. For pulling…this is the interesting one…regular pull ups are fine and will be helpful, however I really think you need to go harder. Basically, progressing toward the one arm chin up will help here. One arm dead hangs will help give you the proprioception necessary to actively pull your arm into the socket while maintaining the tension in the arm. One arm flex hangs will help with your ability to simply pull hard enough for the flag. But, doing full range pulls is still very beneficial for the flag. I’d suggest weighted pull ups (enough to make it challenging), and in my experience muscle ups have a nice carry over to the flag. Basically, just make sure your training is balanced so that your overall fitness level is progressing at an even rate. Work the flag as skill work. I personally worked it probably a couple of times a week for just a few minutes at a time. The thing is, you don’t want to be tired, and if you’re working out consistently odds are a lot of the time you are not going to be at 100%. You need to be well rested for flag training. But don’t worry, you will get there eventually. Oh, one more tip. When you press hard with the bottom arm, it creates the baseline for the tension that you need for the move. That is, you can feel your body start to gravitate toward horizontal, around this “line” of tension that comes from your arm and goes out horizontally from the pole. Think of your body as a zipper, and when you press down it is allowing you to “zip” yourself up into the horizontal plane. Facilitate this by pulling really hard with the other arm. Thanks Robby! I’ll definitely keep working on those excersises! And thanks heaps for the advice, very useful! Thanks, Mitch! There are many ways one can structure a workout. I think Robby’s given you some good food for thought. I just got CC1, The Naked Warrior and your book Raising the Bar love them all. been working out for a long time and this has opened up a whole new world. My question is can CC1 and 2 be worked together on one schedule? Absolutely! The whole concept of CC2 is ancillary training for CC1, so they definitely complement each other well. Personally I would use CC1 for primary workouts and CC2 for warm up/cool down and/or “mini” workouts.